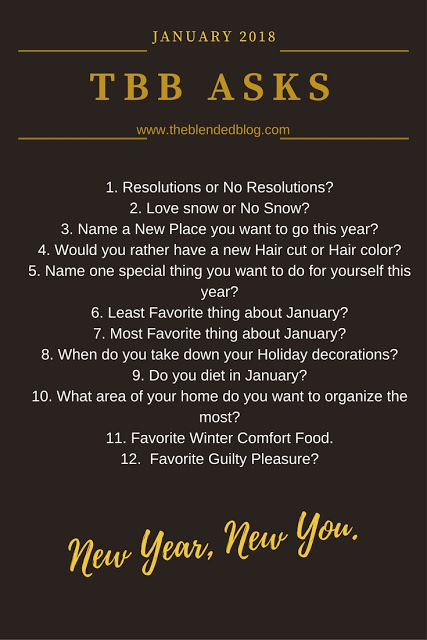 Trying a new link up today with The Blended Blog with a little Q and A for the new year. I wrote about this yesterday, I made some vague goals, but not really into resolutions. Like most people I'm just trying to be healthier and more organized with my time. I have decided to embrace winter and the snow. I used to declare "I hate winter" on a regular basis, but now I'm okay with it. I heard the saying the other day "there is no bad weather, only bad clothing", which I can get behind. If you're warm and dry you can enjoy being outside in the winter. The kids love it so much and we always want more snow for skiing. I much prefer living in an area with four seasons so we can really appreciate each one. 3. Name a new place you want to go this year. We don't have any trips planned and I'm not sure what we will do, so instead I will say I'd like to visit new places in Ontario or even in New York State. It would be fun to take a little weekend trip somewhere fairly local. 4. Would you rather have a new hair cut or hair colour? Good question, I haven't gotten highlights for over a year and I kind of miss that, so right now I'd rather get the colour. Spend more time relaxing. I definitely do things that I enjoy all of the time, but I have a difficult time just having down time. I always feel like I should be doing something else like making food, cleaning, or going out to do something. I'd like to just sit and play with the boys or watch something silly or have a nap when Q naps. 6. Least favourite thing about January? I know I just finished saying I don't hate winter anymore, but I really do dislike driving home in the slow traffic when the weather is bad, and the salt that gets brought it on our boots, and the smell that comes from damp winter clothes. 7. Most favourite thing about January? Like most people, I like getting back into a routine. Christmas is wonderful but it is an abundance of treats, late nights, weekend activities, and spending. January is a nice time to cut back on those things and just focus on the day to day stuff. This year we took them down on January 5th. Our outdoor lights are still up because it has been so cold, but I think they will come down this weekend. In years past we have taken them down anytime between the 27th and the 1st, it will usually depend on how dry the tree has become. This year it did pretty well so we enjoyed it for longer. No, I don't diet anytime of the year. My goal is always to make healthy choices but I do not specifically avoid certain foods or drastically limit my portions. This year I am trying to make more plant based choices and I like that so far, but I live by the philosophy of enjoying my food, whatever that may be. It's always my clothes. I did a good job of cleaning out my drawers after Christmas and I made some tough cuts to my wardrobe. I need to do my closet next. 11. Favourite winter comfort food? French onion soup. I know you could make this anytime of year, but I would very rarely make it when it is warm out. I love the bread, the cheese, the rich broth, mmm. Leftover Christmas chocolate. Our cookies and other sweets are long gone, but the chocolate we got in our stockings and as gifts is still hanging around and I will sneak a few pieces after supper and maybe in the morning before running out the door. Ooooooo French onion soup! Nice to meet another canadian blogger- thanks for linking up!